I few weeks back I took a random trip to Santa Barbara, California. While up there I was told that the Brewhouse was the place to go for good food and good beer, so I jumped in my car and headed that way. I was craving a little bit of hops so I ordered the Nirvana Pale Ale. This American Pale Ale is one of their year-round brews and has an easy drinking 5.5% ABV. West Coast style pale ale. Made from pale and crystal malts, and a generous amount of Cascade hops. Spiritual enlightenment by the pint. Nirvana pours an ice tea brown with apricot-colored highlights. The head starts as a faint ring, but quickly fades into nothingness. Nose is full of pale malts, toffee and clay, with a faint hint of peach. It’s odd that they call this a “West Coast style pale ale” because the nose made me instantly think of a British pale ale. The taste was a lot hoppier than I would have expected after quaffing this brew. Kent Golding hops (I think) come through big in the front, before fading to a sweet toffee-like flavor. A graininess is present, but it isn’t enough to distract from the other flavors. Mouthfeel is light to medium with a residual stickiness that is known to the style. There is a bit of drying that I expected. It isn’t as easy-drinking as a British pale ale, but not as sticky as an American pale ale. 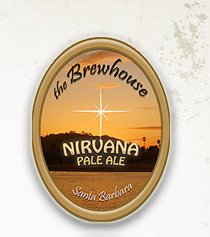 Nirvana is the grandchild of an American pale ale and a British pale ale. It does a fine job of walking the line between the two styles. It wouldn’t be my choice for a session beer, but it cleansed my palate just fine.